rAge gaming expo is coming to Cape Town. 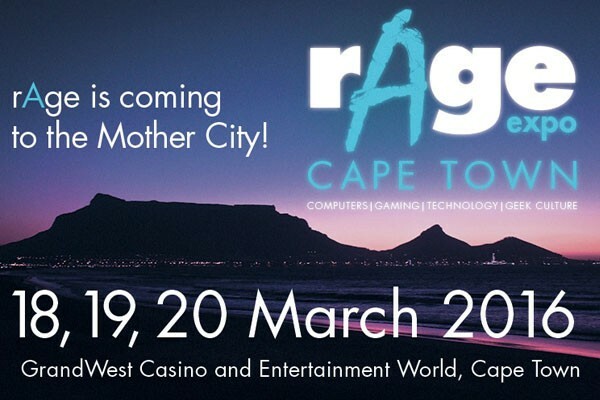 Cape Town is set to receive its own version of rAge in 2016, which will be run by the team behind Joburg’s annual gaming exposition. Titled the “really Awesome geek experience” – the original rAge is the “really awesome gaming expo” – the event will be run by Michael James and his team from NAG, according to IGN Africa. The event will be held at the GrandWest Casino and Entertainment World on 18, 19, and 20 March in 2016, with tickets set to go on sale at Computicket from 1 December. “We’ve always known that there is a very hungry audience in Cape Town that needs to be fed but we’ve never had the resources to address the demand. 2016 is the year that we start realising this dream,” said James. Besides the difference in name, the event is set to emulate its Joburg counterpart: hosting the usual games, tech, hardware, cosplay, comics, and “a lot of caffeine”. “Basically, it’s going to rule,” said James. There will also be a NAG LAN at the event, which will host 576 gamers. “In future years we will be looking to expand and also include eSports,” said James. Tickets for the rAge 2016 NAG LAN will go on sale at Computicket on 28 November.